Sixteen-year-old Kelly Sildaru is currently the world’s best teenage skier. She keeps winning… halfpipe, slopestyle,you name it, she’s on the podium. But behind the scenes, she’s just a regular teenager, spending her free time getting on with her homework and hanging out with friends. 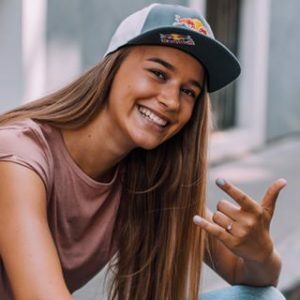 Kelly Sildaru first hit the headlines in 2016, when she became the youngest athlete ever to win a gold medal at the X Games, winning Ski Slopestyle when she was just 13. The following year, not only did she defend her title, but she landed on the podium of every event she entered. She looked unstoppable on skis. However, in autumn 2017, Kelly crashed in the halfpipe, tearing her left ACL. This wiped out her entire winter season, including the 2018 PyeongChang Olympic Games last February. Kelly started skiing when she was just two years, taught by her dad, Tonis. Even as a toddler, Kelly showed great ambition and a competitive streak, trying to follow her dad and his friends doing jumps and rails. “I tried to follow them,” she recalls. “I think I was like 4. I wasn’t big enough to do the rails… My dad had to tell me, ‘You can’t do it yet. '” Undeterred, by the time she was ten, she was winning competitions. The family uploaded some footage of her skiing to YouTube, whereupon K2 stepped forward as her sponsor. Her dad is still her coach and manager. Now, this season, Kelly Sildaru has returned in top form. She won her first competition – the FIS Freestyle Skiing World Cup Slopestyle event in Stubai, Austria in November 2018, then went on to win the Copper Mountain Halfpipe contest the following month in Colorado – her first international ski half-pipe competition. At the Breckenridge Dew Tour Slopestyle, once again she smashed the field with an impressive performance which included back-to-back switch 1080s (three complete spins starting backwards), despite a badly bruised leg sustained during a practice session. At the X Games at Aspen in January, she got silver in the Ski SuperPipe, and clinched gold in the Ski Slopestyle, with left and right side 1080s. Along with other freestyle superstars – such as Austrian Anna Gasser, who became the first woman to land a cab triple underflip earlier this season (read more HERE) – Kelly’s really pushing the sport. Women’s freestyle is better than ever. This 2018/19 season was Kelly’s first time doing all three disciplines: slopestyle, half-pipe and big air and she smashed it, with 99 points, 2 golds and a silver. But beyond the bright lights of the podium, Kelly is just an ordinary teenager. She always travels with her little brother, Henry, beside her. After competitions, she is welcomed back like a hero in her home town of Talinn but for the most part she’s just a regular teenager, spending her time doing homework and chilling with mates. “Always when I’m going somewhere, I’m taking my books and stuff with me. Before or after skiing, I’m doing my schoolwork. When I’m back in Estonia I’m going back to school like a normal kid,” she says.